As any Asian traveller knows, getting around can sometimes prove to be a little difficult. Bus schedules, train schedules, expensive flights, and a difficult language barrier can all look like giant hurdles, but with a little research, getting around is actually quite simple. In particular, Thailand has one of the best rail systems in the world and is often the easiest and most scenic way to get around the country. If you’re not into trains, buses and flights are equally reliable and often just as inexpensive. 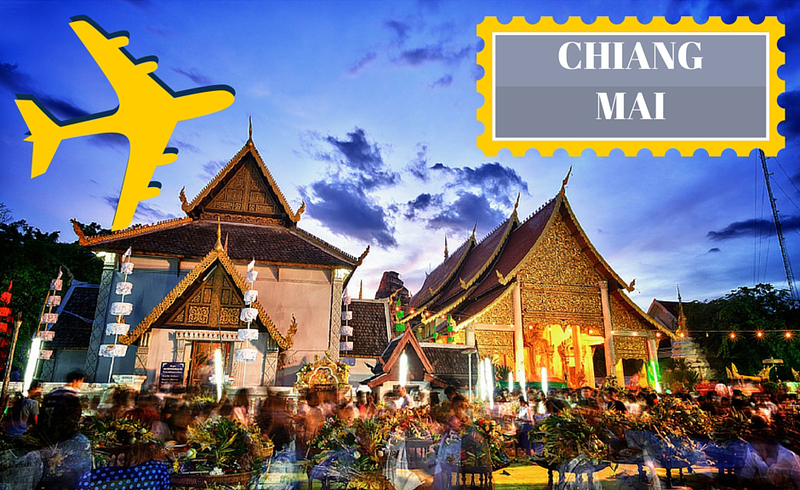 Providing you don’t want to walk to Chiang Mai (about 134 hours from Bangkok), we’ve detailed the best ways to get there without any hassle. Bangkok to Chiang Mai is one of the most travelled routes in Thailand. As such, getting between these two destinations is usually hassle-free and inexpensive. The easiest and simplest way is to go by train. For people put off by the idea of Asian train travel, understand that trains in Thailand are far superior to that of other Asian countries. Thai trains are very comfortable, modern, efficient, and are current with international safety standards. Chiang Mai to Bangkok is by far Thailand’s most travelled train route. The air-conditioned train cars provide relief from the often brutal heat while trekking through Thailand’s beautiful scenery. The overnight sleeper train will cost about £18 and provide you with a stunning early morning backdrop as you arrive in Chiang Mai. Alternatively, you can take a day train which will cost you around £12 and experience the full range of the Thailand landscape. There are many different options for you to take when travelling by train from Bangkok to Chiang Mai. Depending on your level of desired luxury and time spent gazing at the sweeping panoramic views, you can expect to pay anywhere from £5 - £30. The biggest downside with train travel is that it’s the slowest way to get around. But if you have the time, traveling by train is the best way to go to get the best scenic and cultural experience. For more information on train travel, go to the official website at http://www.railway.co.th. But the site is not in English, so having a means to translate it will be necessary providing you don’t speak Thai language. Alternatively, you can travel to Chiang Mai from Bangkok by bus. Like the trains, these buses are very modern and provide a lot of comfort when making the often 11 hour journey northward. Most buses come with air conditioning, washrooms, and even offer snacks, while the more expensive charter buses are also equipped with televisions and meal services. For these more expensive buses, expect to pay about £17 while the lesser luxury (and often slower moving) buses will cost around £9. Several companies run bus services in between these two cities, so it’s a good idea to see which ones match with your time schedules and budget. Buses are usually a little bit quicker than trains, but are much less scenic as they traverse over busy highways and well-travelled paths. Flying from Bangkok to Chiang Mai is the quickest method. There are multiple airlines which run this route regularly so finding a flight will not be a problem. And the price is not expensive either. For a 1.5 hr flight from Bangkok to Chiang Mai, expect to pay £20. That price tag may look enticing, but keep in mind that there’s the expense of getting to and from the airport which adds significant cost, not to mention additional travel time. Luckily, the airport in Chiang Mai is only about 20 minutes away from the city by car (or taxi), but no public transportation is available. While the two cities are separated by nearly 1,500km, getting from Phuket to Chiang Mai can be relatively simple if you give yourself enough time and plan accordingly. There is no train that runs from Phuket direct to Chiang Mai. There isn’t even a train that runs direct from Phuket to Bangkok. If you’re starting in Phuket, you’ll need to take a bus to Surat Thani. Once there, you can catch the train from the railway station to Bangkok. Once in Bangkok you can continue your journey up to Chiang Mai. It sounds a little daunting, but is actually relatively easy especially if you can set aside an entire day to travel. You can attempt to navigate the schedules yourself, or you can go through a company that runs a combined bus/train service, like Phantip at their website http://www.phantiptravel.com, or at www.12go.asia. If buying through these companies, expect to pay around £20-£30 depending on your desired level of luxury. If you want to purchase the tickets yourself, a bus from Phuket to Bangkok costs about £5 and the train will run you around £20-£30. For convenience, it’s a best idea to go through a travel agent that combines both train and bus fares. Also, you can opt to take a 14 hour bus ride from Phuket to Bangkok for about £20 and skip the train entirely. Alternatively, you can take a taxi to Bangkok which will cost about £300. This is not practical, however, as taking a short-haul flight from Phuket to Bangkok would be substantially cheaper and quicker. The most expensive flight from Phuket to Bangkok is around £40, but unless you need to stop off in Bangkok, you may as well just fly direct to Chiang Mai for around £20 more. Once you’re in Bangkok, you can take either the train or the bus method as mentioned above to finish at Chiang Mai. This is an often times gruelling journey if you’re paying attention to the time spent travelling (average 22hrs), but if you look out the window, you’ll quickly forget about the distance and see the natural beauty of Thailand. That said, there is one bus company that offers a direct service between Phuket and Chiang Mai. For more information check out their website at www.greenbusthailand.com. This is obviously the quickest and easiest way to get to Chiang Mai from Phuket. What can take over a day by land will take just 2 hours by air. 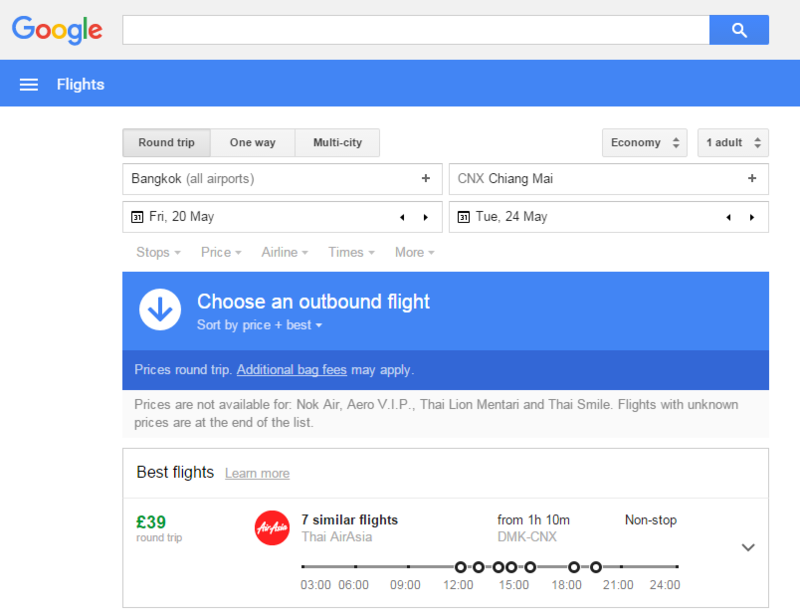 The cheapest flight available from Phuket is £62 with more expensive ones going up to £400 (and several hours of layover). If you don’t want to spend all day on a bus or a train, for about twice as much money, you can get there in a 2 hour flight. This is definitely an attractive option if you secure the direct flight ticket ahead of time. Getting from Koh Samui adds in the extra travel time of a ferry, but this is not that much of a problem as the ferry also connects to a bus which will lead to Surat Thani. The ferries run once an hour and take about 1.5 hours. Once you arrive at the ferry terminal, you can hop on a bus which will take you to Surat Thani where you can catch a bus or train to Bangkok. For about £22, you can also take the ferry to the pier and catch a 13-hour bus to Bangkok. Once in Bangkok, you can take any of the above methods to get up to Chiang Mai. It may be a smart idea to find an agent who can book all of these services together minimising the time spent travelling and making the most of your money. Long layovers and transfers in between bus/train stations always add extra travel times and costs. Again, this is easily the quickest way to get up to Chiang Mai from the south of Thailand, and if you’re in a hurry, this is also the wisest way. But at £95 (the cheapest flight), it’s not the most economically friendly. There’s only one direct flight a day, so if you don’t want to have a layover in Bangkok (or worse, somewhere much further away), it’s best to plan ahead and book the flight early. Getting to Chiang Mai is relatively easy if you know how to plan accordingly. Sometimes weaving through timetables can be a little daunting, but Thailand is known for its friendly and helpful people. If you’re ever struggling to understand something, you can always ask and you’ll quickly find someone willing to help. Also, booking through an agent that knows how to combine bus/train/ferry tickets is a worthwhile venture that will surely come in handy when traversing throughout the entire country. With a little patience and curiosity, you’ll quickly realise that your journey to Chiang Mai, or anywhere else, will be filled with adventure and excitement. 26 hours may sound like a long time, but after spending that time talking to locals and gazing out at the scenery, you’ll be ready to do it all over again! Relax and unwind after your journey in this 5 star Hotel in Chiang Mai that offers an intimate and exclusive all-suite luxury hotel experience. 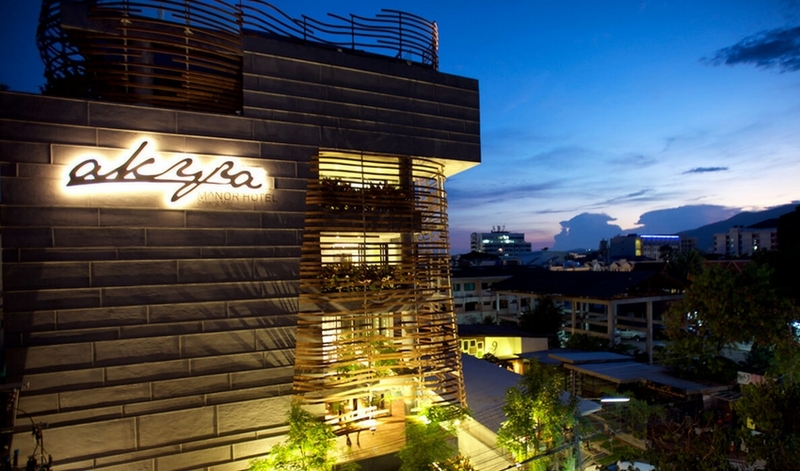 It’s the hip downtown hotel Chiang Mai never had. Check in to pure urban style and big city sophistication in the heart of this charming northern city’s most buzz-worthy street – Nimmanhaemin Soi 9, known locally as ‘coffee street’. Take in the chic boutiques, galleries, bars, and coffee shops, then return to your sanctuary, warm northern Thailand hospitality. akyra Manor Chiang Mai is a 30-key, all-suite luxury hotel, with 23 suites at 60 sqm and 7 larger suites at a spacious 100sqm created around a courtyard - a ‘room within a room’ concept designed to bring the outdoors inside while not sacrificing privacy.